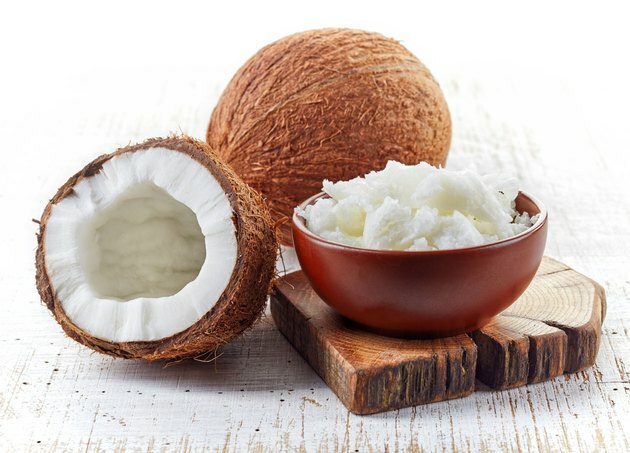 Despite the negative portrayal of saturated fats in nutritional circles, coconut oil has taken many plaudits for the array of benefits it offers. Individuals interested in its positive effects on cardiovascular health, yeast control and energy production may wish to consider the differences between the refined coconut oil and its unrefined equivalent. A high proportion of the coconut oil that ends up in foods may be classified as refined. Tropical Traditions defines refined oil as a product that has undergone bleaching and deodorizing. Such treatment becomes necessary because of the unsanitary conditions in which farmers often store the coconut solids before they send them to a factory for processing. Unrefined oil, also known as virgin coconut oil, does not undergo the same process as its refined equivalent. Tropical Traditions explains that producers make the virgin product by mechanically pressing the coconut meat soon after picking. Because of this difference, they need not use any chemicals to treat the oil and it retains more of the compounds naturally present. The polyphenols remain an important part of coconut oil. Dr. Bruce Fife, a physician and the author of “The Coconut Oil Miracle,” notes that these plant compounds demonstrate an important antioxidant effect inside the body, inhibiting the oxidation of cholesterol. Through this mechanism, coconut oil can reduce the development of atherosclerosis and the risk of cardiovascular disease. Because the polyphenols become damaged during the bleaching process, you should not expect such positive effects from refined coconut oils. A highly saturated oil, three-quarters of coconut oil comes in the form of the medium chain fatty acids. These unique compounds, a subdivision of saturated fat only found in high concentrations in coconut oil, can help support the immune system and eradicate yeast infections. Fife explains how these acids can diffuse into the cell membrane of a fungal cell before causing its death by dissolving. Because of their saturated nature, the medium chain fats remain stable in both the refined and unrefined oil. The Academy of Nutrition and Dietetics recommends consuming unrefined coconut oil in moderation to limit your saturated fat intake, and avoiding refined coconut oil altogether.